It's with great pride that we share a letter from the Secretary of State for Education and the Minister of State for School Standards. 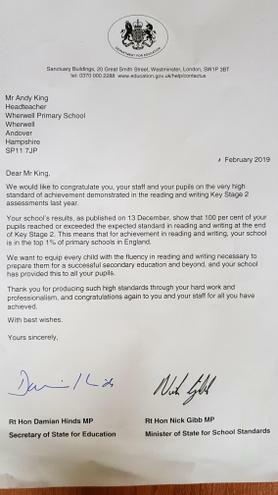 Westminster recognized that school results published on 13th of December, showed that 100% of our pupils reached or exceeded the expected standard in reading and writing, positioning our school in the top 1% of Primary Schools in England. A huge congratulations to the staff and the pupils on this very high standard of achievement.